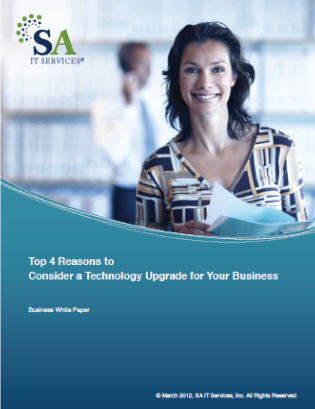 SA IT Services, an industry leader in Technology Upgrade Services, today released their most recent white paper entitled, “Top 4 Reasons to Consider a Technology Upgrade for Your Business." SA IT Services releases white paper, "Top 4 Reasons to Consider a Technology Upgrade for Your Business"
SA IT Services, a recognized leader in outsourced IT support and services, today released their latest white paper entitled, “Top 4 Reasons to Consider a Technology Upgrade for Your Business.” The report compiles recent research on the advantages, disadvantages and cost implications for companies considering upgrading their office technology. “Top 4 Reasons to Consider a Technology Upgrade for Your Business,” highlights the fact that most companies operate with outdated office technology. Research shows that companies typically believe that their existing technology is adequate. However, studies show that most company’s office technology is outdated and upgrading would create significant productivity gains. According to research by Intel, office computers older than four years create twice the number of help desk calls and twice as much downtime as computers three years old or less. The research concludes that adhering to a three-year technology upgrade cycle provides the lowest total cost of ownership (TCO). However, often great cost savings can be realized by not upgrading technology but by better aligning IT goals with the broader goals of the organization. The Economic Intelligence Unit (EIU) and Cisco Systems studied companies who actively aligned their IT and business goals. 43% of companies reported they recognized cost savings even before implementing new technology. As a leader in technology based service; SA IT Services provides fully customized and effective advice about product upgrades. SA IT possesses experience across most OEM platforms to address and resolve problems in any environment. SA IT delivers outsourced IT Support services via a direct employed staff of over 300 IT professionals nationwide who can provide: product management, solution architecture, and field technical support.